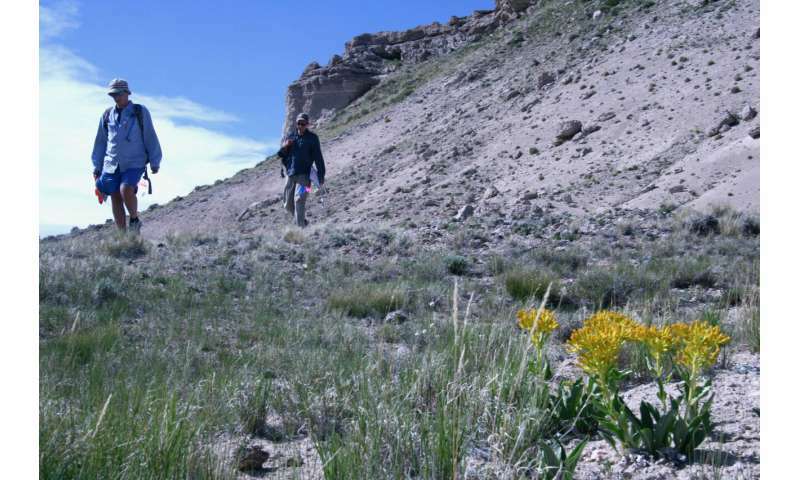 The desert yellowhead, which grows on fewer than 55 acres in the Beaver Rim area of Fremont County, has been listed as a threatened species under the Endangered Species Act since 2002. The new research, published by lead author Reilly Dibner, a postdoctoral researcher formerly at UW's Haub School of Environment and Natural Resources, provides insights into how the plant has managed to survive in small, stable numbers. But the scientists say its long-term future is difficult to predict because of increasingly variable rainfall patterns and warming. "A small, isolated population like this generally is thought to have a high probability for extinction, but several mechanisms have allowed the desert yellowhead to persist so far," says Dibner, who received her Ph.D. from UW's Program in Ecology. "While this plant has shown remarkable stability over its short known history, we lack the ability to confidently predict its future chances of survival." The plant, also known as "yermo"—which comes from its scientific name, Yermo xanthocephalus—was discovered in 1990 by botanist Robert Dorn in the Sand Draw area southeast of Riverton. That population was monitored closely for a decade by Central Wyoming College faculty member Richard Scott and his wife, Beverly, along with other volunteers. In 2010, as a result of extensive searches by UW's Natural Diversity Database and the Bureau of Land Management, a second, smaller population of desert yellowhead was discovered by UW scientists Bonnie Heidel and Joy Handley about five miles away at Cedar Rim. The desert yellowhead has attracted attention because of its unusual geographic distribution, uniqueness and extreme rarity. It's not known if the desert yellowhead has always had such a limited range or if it once was distributed more broadly. Dibner and the other researchers used detailed population data collected by the Scotts, along with five years of data from their own study, to assess the factors that allow the desert yellowhead to survive in such small numbers. They concluded that several mechanisms are in place to keep the plant from disappearing. The research found that despite the low density of the desert yellowhead—there are fewer than 15,000 individual plants scattered across the 55 acres—these populations survive partly because of a principle called negative density dependence. This means that the populations tend to grow fastest when at low numbers, allowing them to bounce back from low numbers. "In particular, negative density dependence is an important mechanism allowing subpopulations to recover from unfavorable environmental conditions," the researchers wrote. 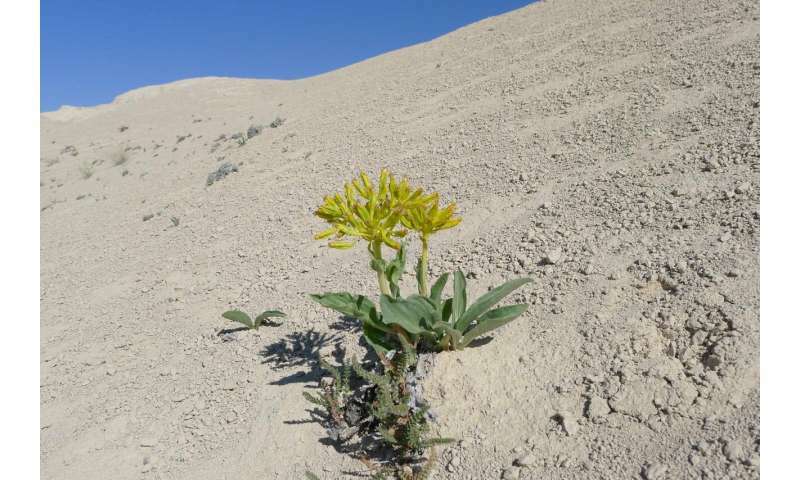 Additionally, diversity in the plant's responses to precipitation, soils and other environmental factors has served as a stabilizing mechanism for the desert yellowhead. For example, some of the plants growing below steep slopes respond relatively poorly during wet years, while dry years are harder on plants located in flatter areas. That makes the desert yellowhead more likely to persist in a variable climate, the scientists say. The researchers used computer simulations to attempt to predict the future population of the desert yellowhead. Simulations based on historical numbers estimated a substantially greater chance of long-term survival than simulations based on the more recent five-year study, but the scientists say that's likely because of drier-than-average climate conditions during the more recent study. "We found that longer-term census data gave more realistic, higher estimates of population stability than did our shorter-term demographic study," they wrote. "What remains unclear is whether or not central Wyoming will face wetter or drier conditions with climate change, or how increasing temperatures will mediate effects of moisture for yermo," they added. "Thus, as with most other species, we still lack the ability to predict confidently the dynamics with changing abiotic (nonbiological) conditions."